The Radio Data Logger TA-140 is a professional data logger for temperature and air humidity. This radio data logger allows a detailed recording of temperature and air humidity as well as an active monitoring. Recorded data (up to 50,000 data records can be stored on the radio data logger) can be transmitted for comfortable evaluation on a pc via USB interface or can be called in the display. The software included in delivery helps handling the loggers and can be used as plain interface for own software applications. The logger can be expanded up to 8 stations. 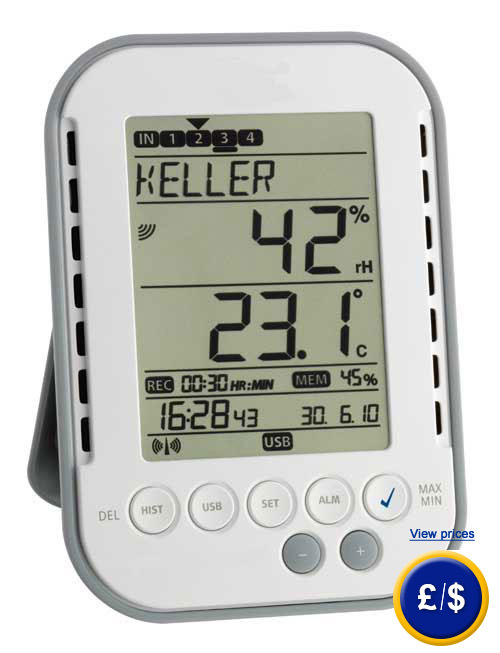 This radio data logger is ideal for indoor climate monitoring in test rooms and production plants, for gardening (alert of limit value exceedence), climate monitoring for foods, for museums (evidence via integrated data storage) and for test chambers (simultaneous monitor of several measurement stations via using of radio sensors). If there are any questions about this Radio Data Logger TA-140 have a look at the technical specification below or call: UK customers +44(0) 23 809 870 30 / US customers +1-410-387-7703. Our technicians and engineers will gladly advise you in all data loggers and all products in the field of measuring instruments, regulation and control and scales.